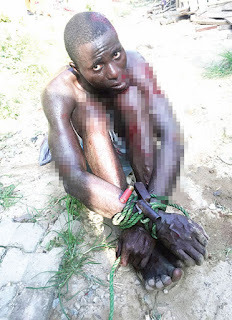 An armed robber has been nabbed and disarmed by some church workers and the guard in a community in Ogun state. According to a report by Punch Metro, some workers at Grace and Truth Tabernacle have reportedly disarmed a suspected robber, Samuel Ola, who allegedly invaded the church’s premises in the Magboro end of the Lagos-Ibadan Expresseway, Ogun State. It was gathered that 37-year-old Ola and his accomplice, identified simply as Aboy, had attempted robbing a motorcyclist when a mob gave them a chase. While escaping from the robbery scene, Ola reportedly scaled the fence into the church’s compound. Punch Metro reports that a security guard at the church, Peter Okwandu, had earlier apprehended the second suspect, Aboy. The librarian of the church, Patrick Osagie, said Ola was the fifth criminal suspect to enter into the church. He noted that past experiences made the church to hire a security guard to monitor the premises. The state Police Public Relations Officer, Abimbola Oyeyemi, confirmed the incident, adding that the suspects had been transferred to the Federal Special Anti-Robbery Squad.